Set the slow cooker to low and add cubed bread pieces. Pour wet ingredients into the slow cooker with the bread, making sure each one is well incorporated and all the bread is coated. Cook on low for approximately 4 to 5 hours. Remove the lid and cook for 15 to 20 minutes more to give you a caramelized top. Make sure to spray the insider of your slow cooker with nonstick cooking spray, or use a liner (parchment paper), for easy clean up! My husband loves bread pudding; says it reminds him of his childhood, and waking up to the warm smell of spices on a weekend morning. I promised him I'd made bread pudding more often if it wasn’t a daunting task. 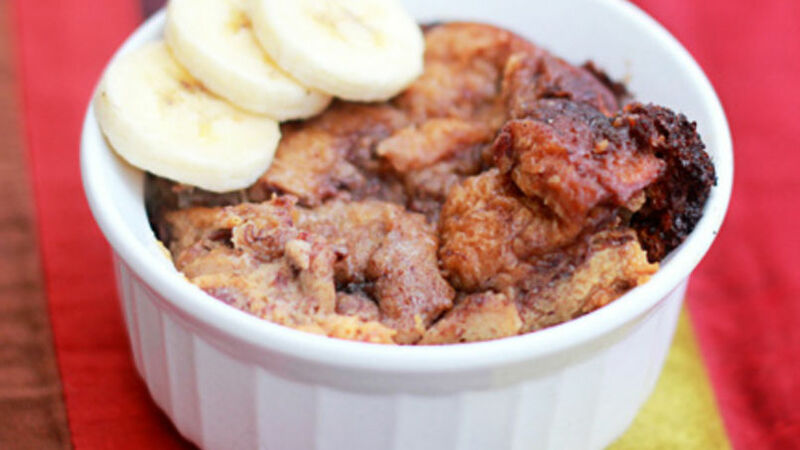 Bread pudding doesn’t have to be time consuming if you make it in a crock-pot. And this recipe for Banana Raisin Bread Pudding is perfect to set at night and enjoy in the morning as a special breakfast treat. It is loaded with warm spices, plumped raisins and banana. But let’s not forget the best part – the bread!